Contact Us - Pediatric Dentists in Phoenix and Glendale, AZ. We are conveniently located at 6750 N. 19th Ave. Phoenix, AZ 85015. 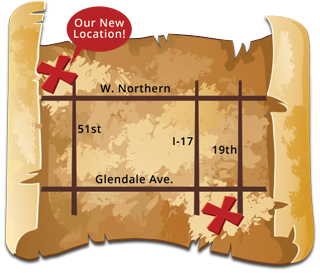 We are one block south of Glendale Avenue on the west side of 19th Avenue. Our office is open Monday through Friday, with hours that can accommodate most any schedule. Appointments are offered Monday - Thursday, between 7:00 AM and 5:30PM, and Friday from 7:00 AM to 2:00 PM. At Phoenix Pediatric Dental we are committed to our patients' dental health no matter what time of the day or night it is. If you are a current patient, and have a dental emergency after regular office hours, please call us at 602-242-5741. If you have never visited our office please fill out our new patient form and bring it with you when you come in for your appointment. We accept most insurance. If you would like to be sure, please call us.